Pneumatic Diversity Vents - The Chip's Challenge Wiki - The Chip's Challenge Database that anyone can edit! 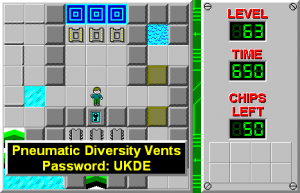 Pneumatic Diversity Vents is the 63rd level in Chip's Challenge Level Pack 4. 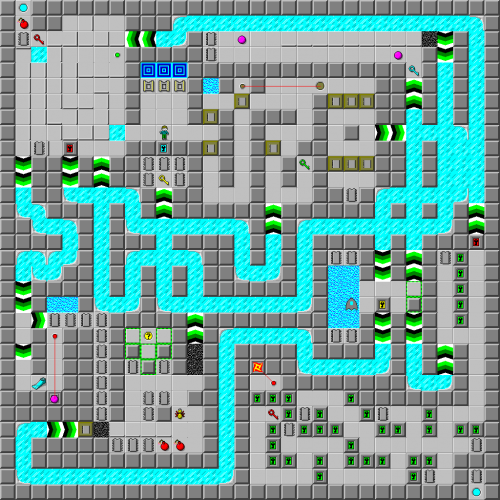 It is named after a concept from the game Portal 2 - large tubes that carry objects through them along an air current, which are represented in this level by several force floor/ice slides that connect various segments. This level contains another secret hint, with a password to skip further in the set. The secret password is WCRV, which will take the player to the 97th level, Lockdown. This page was last edited on 24 March 2019, at 03:41.